This product may help to maximize performance, strength, balance & flexibility. WHY IS IONIC BALANCE IMPORTANT? A set of electro-chemical processes take place in our body to generate electro-magnetic energy. We believe this energy field surrounds & interacts with our physical well being. An efficient exchange & balance of positive & negative electrical charges(ions) is essential to good health. The ideal human frequency, known as Schumann Resonating Frequency is approx 7.8 hertz. Energy balance, systemic harmony & good health occur when your body maintains ionic balance & when our frequencies resonate in sync. Naturally occurring frequencies we think react positively with the body's energy field to help improve cell to cell communication. When cells communicate well, we notice improved balance, flexibility, strength, endurance, stamina, focus & general well being. When Hotband® comes in contact with the body's energy field, we think it resonates at a low-level frequency that may improve the flow of energy throughout the body & may help to regulate static energy. This improved energy flow may achieve to promote faster synaptic response (brain function), enhanced muscle response (in both fast & slow twitch tissues), increased stamina (better oxygen uptake & recovery), improved flexibility (faster recovery) & improved balance. 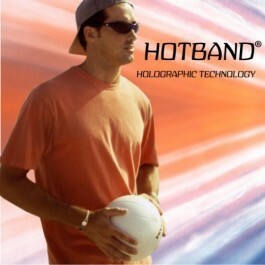 Hotband® Holographic wrist bands may help to improve balance, flexibility, endurance & confidence, although there is no clear scientific proof for this. Users report that Hotband® helps their body recover faster, reduce levels of stress & improve focus. People may feel the effects of Hotband® by testing the body's energy field using simple Kinesiology. It is common to identify immediate change in muscle strength, balance, flexibility & range of motion. To create general wellness, build strength & improve balance & flexibility. Note : We have no scientific proof that this product will do any of the above. People purchasing this product buy it on the premise that it may or may not provide the detailed benefits listed above. We make no claim or guarantees.